In Praise of Barlow Lenses. Three fine, low-cost shorty Barlows, ideal for use with my Newtonian reflectors. From left to right: the Meade 3x, the Orion shorty Barlow 2x and the Astroengineering 1.6x Barlow. In this day and age, where almost every item of equipment we use under the stars is taken for granted, it pays to remember that we have a lot to thank our astronomical forebears for. A case in point is the humble Barlow lens, which has enjoyed a very long and illustrious history with visual observers, where today it remains an indispensable tool as well as a cost-saving device for the amateur astronomer. Contrary to popular belief, the concept of the Barlow lens does not reside entirely with the musings of the English mathematician Peter Barlow (1776-1862), but actually had its origination in the fecund mind of the 18th century German philosopher and mathematician, Christian Wolff (1679-1724), who first conceived of the idea of adding a concave lens ahead of the eyepiece but behind the objective of a telescope in order to provide greater magnification and with a slight increase in focal length. The result had mixed fortunes however, in that the resulting images in an achromatic telescope, while certainly enlarging the image, also deteriorated the achromatism achieved by the combination of the crown & flint object glass. Charistian Wolff(1679-1724) : the originator of the Barlow lens concept in the 18th century. Image credit; Wiki Commons. The problem was once again studied with renewed vigour in the first half of the 19th century, when Peter Barlow, then a Professor of mathematics at the Royal Military Academy, Woolwich, England, computed the design of an achromatic concave lens which was made by the optician, George Dollond, and mounted in a telescope where it showed very promising results. Some of the earliest ‘guinea pigs’ to experiment on the new device included the Reverend William Rutter Dawes and the Admiral William H. Smyth, who both commented favourably on the new contraption as early as the late 1830s and early 1840s, reporting that the image was left just as colour free as when the telescope was used without the contrivance, even allowing them to vary the magnification at will by moving the doublet lens either towards or away from the ocular lens. An achromatic lens( the macro-micro lens), which slides into the tube of the micrometer, was frequently used by Mr. Dawes in his observations of double stars. The effect of the interposition of this lens is to increase the magnifying power nearly in the ratio of two to one, without any very serious diminution of light. It is, therefore, of great service in the measurement of difficult objects which require increase in power with considerable light. How does a Barlow work? Because it is a negative(diverging) lens consisting in its most basic form as either an air-spaced or cemented crown-flint doublet, it changes the angle of convergence, making it longer, as though the beam were coming from an objective lens or primary mirror with a longer focal length. What this means in effect is that a 2x Barlow will double the effective f ratio of your telescope, turning an f/5 system into an f/10. And though the Barlow lens can introduce some additional errors into the optical train, if well made, it will almost certainly remove more aberrations than it generates. This is easy to see when using an ordinary eyepiece, such as a 20mm Plossl or some such, in a fast optical system like my two Newtonian reflectors. Used without a Barlow lens, the 20mm Plossl will give very good on-axis performance but less so off-axis. Now insert a 2x Barlow lens ahead of the eyepiece and the off-axis performance is considerably improved! That’s because the cone the eyepiece ‘sees’ looks like an f/10 optical system and not an f/5 system. In the days before anti-reflection coatings, Barlow lenses caused a small but noticeable reduction in image brightness, as well as the odd ghost image due to internal reflections, especially on bright objects, but with modern multi-coatings appplied to all air-to-glass surfaces, this light loss is reduced to negligible levels(~3 per cent). Barlows come in all shapes and sizes, offering magnification boosts in the range of 1.6x right up to 5x. That said, by far the most commonly used Barlow lenses offer powers of either 2x or 3x. In general, longer Barlow lenses tend to give greater magnification boosts than shorter ones, but there are always exceptions.What is more, the power printed on the barrel may not be the power you get in field use, but it’s normally quite close. In addition, with refractors that employ 90-degree star diagonals, a 2x Barlow used in normal mode can also give a 3x boost if screwed into the front of the same diagonal. Bear in mind though that most modern Barlow lenses are intended for use at the power they show on the barrel and may not perform quite so well when moved to provide a different magnification. One should always avoid models offering a range of magnifications by moving the optics in a sliding tube, for example. The Barlow lens has the inherent property of increasing the eye relief of any eyepiece used in combination with it. This is of considerable advantage to those who enjoy very short focal length Plossl and orthoscopics, for example, which by nature offer amounts of eye relief broadly similar to the focal length of the ocular used and thereby improving the degree of viewing comfort experienced by the observer. With my fast (f/5) Newtonian telescopes, I have found through experience that shorty Barlows are better than their longer counterparts, because they always reach focus with them.That said, shorty Barlows also increase eyerelief more than longer Barlows. I have used this to great effect in my study of double stars with a 130mm f/5 and a much larger 305mm f/5 Newtonian. For example, when combined with one of my favourite eyepieces used to resolve close binary systems; a Parks Gold 7.5mm ocular, a 3x Meade shorty Barlow provides a supremely comfortable field of view at 260x in the 130mm telescope with wonderful, edge-to edge-sharpness. Another favourite with a Barlow lens is my old 4.8mm T1 Nagler. This high power eyepiece delivers a magnification of 135x in the 130mm f/5 by itself but the eye relief is quite tight. All that changes though when I use it in conjunction with my 2x or 3x Barlow lenses (yielding powers of 270x and 405x, respectively). Eye relief is much improved and the views that little bit more enjoyable! When Barlowing longer focal length eyepieces, care must be taken to ensure it does not strongly vignette the outer part of the eyepiece field. If the field stop of the eyepiece is greater than the clear aperture of the Barlow, then it will cut off some of the light coming from the outer sections of the eyepiece, resulting in significant light loss and a reduction in the true field presented. Look at the two Barlows shown in the image below, for example. The Barlow shown on the left is the Orion 2x shorty Barlow and the one on the right is the 3x Meade Barlow. Note the larger clear aperture of the former, which makes it better suited for magnifying low-power, long focal length oculars. The 2x Orion Shorty Barlow(left) is better suited to boosting the power in long focal length eyepieces. In recent years, a number of firms have brought to market so-called “apochromatic” Barlow lenses with some kind of low dispersion glass included in the prescription. These can often be sold at higher prices than regular, “achromatic” Barlow lenses with the implication that they will perform better. This is nonsense however, as a good achromatic doublet with properly applied anti-reflection coatings will give essentially the same performance. Indeed, one of the first ‘apo’ Barlows this author has experienced; the Meade # 140; performed significantly worse in field tests than a standard achromatic system costing half as much! The truth of course, is that the introduction of apochromatic Barlows is yet another clever marketing gimmick that has caught more than a few tyros off guard. As proof of concept, consider the excellent Barlow lenses long offered by well established firms such as TeleVue, who make some of the best long Barlows money can buy. You won’t have to look long to see that all of the Barlows Albert Nagler has brought to market are well-made achromatic doublets. If there were an advantage of including low dispersion glass in their prescription, don’t you think Uncle Al would have done it long ago? Nor will a Barlow lens improve the colour correction of an achromatic refractor, as some amateurs have claimed on the vulgar forums. The dispersion caused by the achromatic doublet is completely unchanged when using a Barlow lens. Neither will it increase the depth of focus of the telescope when used normally. That said, Barlows can certainly help achieve larger fields that are corrected for the Seidel aberrations such as coma, for example, which can be mildly annoying to those who use fast f/4 and f/5 relative apertures. The coma free field = 0.022 x f^3. So, for my f/5 Newtonian we obtain a coma free field = 0.022 x 5^3 = 2.75mm. Next, consider how this translates into true field. True field in radians is given by; coma free field/ focal length. (2.75/650) = 0.0042 radians, and then converting to angular degrees gives 0.0042 x 360/2pi = 0.24 degrees. 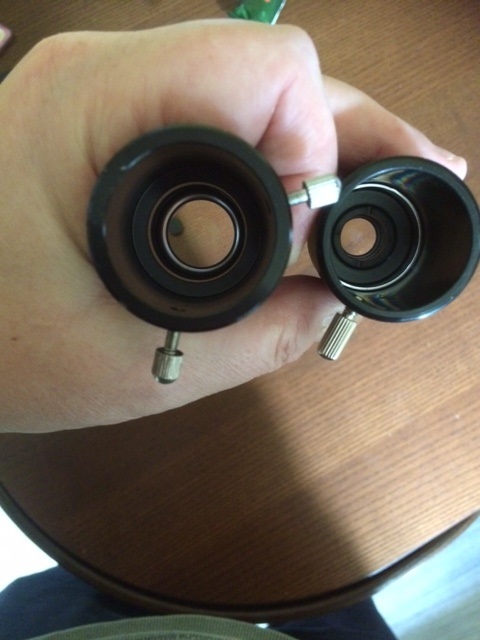 Consider next a typical high−power eyepiece used in double star divination. As mentioned above, one of my favourite combinations for close double star work is a 7.5mm Parks Gold coupled to a 3x Barlow lens, with an apparent filed of view of about 50 degrees. This yields a power of 260 diameters in the 130mm f/5, so the coma free field at this enlargement is: 260 x 0.24 = 62.6 degrees! This means that there is no coma to worry about across the entire field of view using this particular configuration. Barlows will similarly reduce the effects of other Seidel aberrations in similar fashion(though to a varying degree corresponding with how those said aberrations fall off with focal ratio). This helps keep the images of the stellar disks nice and crisp as they move from one side of the telescopic field to the other. Barlow lenses are cost-saving devices too. Indeed, a savvy telescopist can dispense with acquiring a complete set of half a dozen eyepieces say, and instead choose just two or three oculars and a Barlow lens(or two) to achieve the range of magnifications one desires from the telescope. For example, if you have a 25mm and 8mm Plossl, as well as a 2x Barlow used with a telescope with a focal length of 800mm, you can get a nice range of powers; 32x, 64x, 100x and 200x.This is especially true since good Barlow lenses can be had for considerably less money than a fixed focal length eyepiece. My own Barlow lenses cost between £20 and £30 and perform handsomely with virtually all eyepieces I couple them to. For those folk who dislike the change in eye relief caused by a Barlow lens they should consider telecentric devices like those marketed by TeleVue( the Powermate) and Meade. These will not increase the eye relief you get with a given ocular and also maintain the same focus position one enjoys when the eyepiece is used alone. They are however, considerably more expensive than regular Barlows. Barlows also have a very important role to play in astro-imaging, particualrly high-resolution lunar and planetary photography, where they provide very effective focal length boosts and thus an appropriate image scale. They are also supremely useful in binoviewing, by decreasing the amount of in-focus travel necessary to achieve focus with many of these devices. So, in summary, Barlow lenses serve as very important tools for the modern visual observer and imager alike, and are thus very unlikely to go out of fashion any time soon. Good ones can be had fairly inexpensively and will provide the user with a lifetime of applications.